Having recently been a chaperone for a fifth grade field trip, I was able to learn more about the complexities of the lunch period. 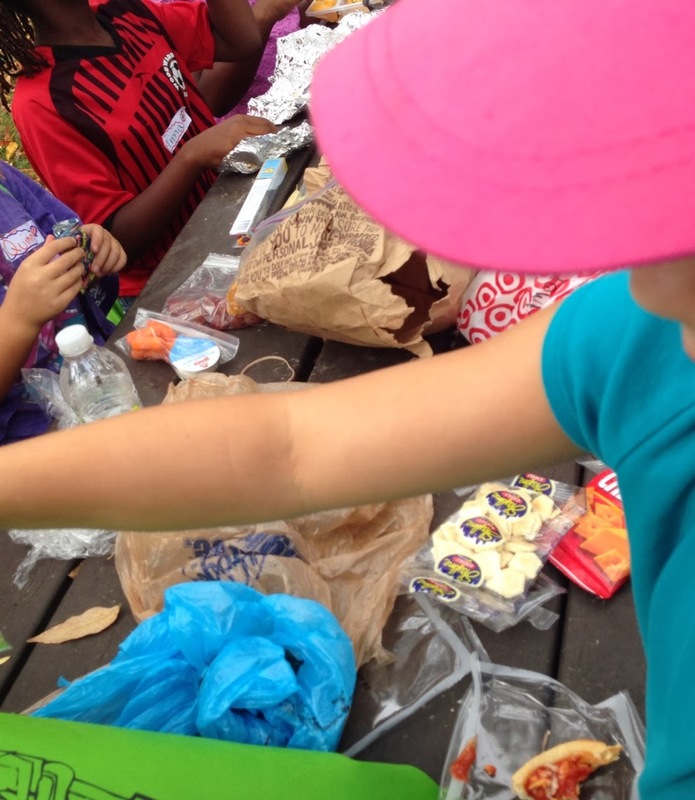 In kindergarten and 1st grade the kids still comply with the no sharing/trading of food from their lunch. As they mature they discover their lunch has value greater than they realized; e.g., lunch items can be used to "buy" M&Ms (or as Frankie called them enimens)!! Knowing the difference between absolute and relative value of your child's lunch items is they key to your success when preparing these meals. 1. Small items are good. If the item is good, they get to eat some and trade some. Smaller items are even better. 2. The food better look good. One speck of fat shows up on a piece of chicken and it'll be as popular as anthrax. 3. Lots of items in a lunch is good, it's a kid's version of tapas and it goes for appetizers, main part of the meal and dessert (see tradeability above). 4. I use portion containers a lot, 2 oz *capped* are convenient and about 9 cents each. 5. Plain old savory snack bags: chips, CheezIts, etc. are like gold on the trading table. Never know, they may trade for something healthier. 1. Celery sticks and individual peanut butter dipping cups. Kids will eat the celery and share dips, so this is where colds come from. peanut butter and nutella (jelly will sog, so opt for a homemade uncrustable). 3. Biscuits with a honey to dip on the side. Biscuits have been a big hit this year. I make them in the morning. One for b'fast, two for lunch. 4. Chicken skewers. This is easier than it sounds. A few chunks of chicken breast (marinated/brined) on a short bamboo skewer, peanut sauce is available already made in an Asian market. I make them the night before and fry them on the skewer in the morning. 5. Candy. I often buy a couple boxes of theater sized candy at the supermarket and divide into portion cups (and hide them) for a small dessert. 6. Raw veggies and ranch is a great lunch. Carrots, sugar snap peas, sliced jicama, celery, no cooking! 7. Beef / Pork / Turkey jerky! My girl went through a big phase of this, but it didn't last long. I think it inevitably became out of favor when the first kid said it looked like poo. 8. Rice rolls, or grocery store fish-free sushi. These are a big deal with the more sophisticated kids. 9. Cheese! A piece of cheese, some bread sticks, ham pieces and a raw veggie, not bad and easy to prepare. 10. Fried chicken drumsticks from the grocery store hot food section has been an intermittent success this year. They get to room temp by the time they're eaten, yum! 11. I use cupcake papers to line a small container, and place cut meats, cheese and crackers in them to make a lunchable. 12. Nutella minis! These go with everything or they can eat them neat.